Jeff Hertzberg, the co-author of Artisan Bread in Five Minutes a Day writes in his introduction that the quest for an authentic deli-style rye bread like what he grew up eating was what started his obsession with bread baking. The result is an extremely tasty rye bread that even the most inexperienced baker ought to be able to bake successfully. Mix the yeast, salt, and caraway seeds with the water in a large bowl or container. Mix in the remaining dry ingredients with a spoon until they are thoroughly combined. Don't worry about kneading, but you want to mix until there are no more lumps of dry flour. Use wet hands to do this, if necessary. Cover the dough loosely and allow it to rest at room temperature until the dough rises and collapses, approximately 2 hours. The dough can be used immediately, though it is recommended to cover it and refrigerate it for anywhere from 1 day to 2 weeks. On baking day, dust the surface of the refrigerated dough with flour and cut off a 1 pound chunk (roughly the size of a grapefruit). Dust the piece with more flour and quickly shape it into a ball by stretching and rotating it. Elongate the ball into an oval-shaped loaf. Allow to rest and rise on a cornmeal-covered pizza peel of cookie sheet for at least 40 minutes. Twenty minutes before baking, preheat the oven to 450 with a baking stone on the middle rack. Place an empty tray on another shelf in the oven. 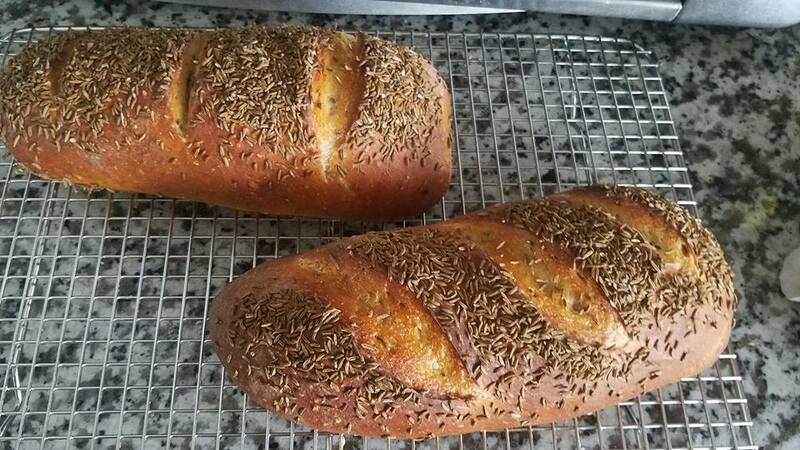 Using a pastry brush, paint the top crust of the loaf with the wash and sprinkle on the additional caraway seeds. Slash deep parallel cuts across the loaf using a serrated bread knife. Slide the loaf off of the tray onto the baking stone. Pour 1 cup of hot water into the other pan and quickly close the oven door. Bake for about 30 minutes, until the loaf is deep brown and firm. Allow to cool before slicing and eating. More tips on baking this recipe on artisanbreadin5.com. 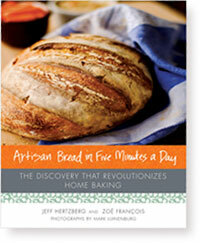 Read a Q & A with Jeff Hertzberg and Zoë François, the co-authors of Artisan Bread in Five Minutes a Day. I have a number of ways to create a ball or boule from a hunk of dough that I use all the time. However when I read your description "quickly shape it into a ball by stretching and rotating it, I must be slow today after a marathon baking session last night but I don't get what you are saying to do. Stretching and rotating a hunk of dough would get you a pizza shape if taken literally I think. Is there a video that shows the process you write about in the book? I can tell you that is one of the things that folks here have appreciated. A video is a huge tool that answers so many questions. BTW Floyd: There is an error in the page code for IE ver 7. When I scroll up and down IE crashes. I thought it was a copy and paste issue but just scrolling kills the IE App. As usual, Firefox is fine with it. My wife has been bugging me to start teaching a baking class for a while and it occurred to me today that a simple easy to follow book would be a great aid for the teacher. I'm going to start as soon as my Dad gets the copy I had shipped to him just now and I get my copy. The price is fair and most people would see it as a value I believe. The Church is always looking for people to host classes for the members. I'll bet they will enjoy it! Jeff, I was wondering if you know that creating surface tension to make that boule is essential for explaining the good spring? I wondered why your boule did not flat out and look more like a ciabatta, for example. Also, do the breads made using older dough (refridgerated left-over dough) taste better than the ones from 2-hour-fermentation dough? I dont own your book....yet...but I watched the video on the Chicago tribune website and I am just amazed. The only thing I really have to ask is this. When making poolish or biga or Pate Fermente I have only ever read that it will last up to 3 days in the fridge. It has a lower percentage of yeast and the Pate Fermente has salt also, yet its shelf life in the fridge is so limited. Or is it the amount of salt in the recipe that slows the yeast down? I am a dubious cook, and if something doesnt look quite right, I dont use it. I have been known to shun a poolish after two days because it has seperated. I am amazed that the Master dough will keep for so long. How does your Master dough differ from a firm prefirment? I bought some rye flour for the first time and figured this would be an easy recipe to try out. So I followed the directions and made a boule with half of it. the rest i stuck the the fridge. let is rise, generously slashed the top with a criss cross and poppe din the oven. when i opened the oven 20 min later to peek i was AMAZED! i have NEVER gotten oven spring like that! The slashes had totally opened up the loaf like a flower. It was georgeous. we are currently eating the loaf withsome broccoili cheese soup. definately a winner. I am going to let the other half sit in the fridge for a week and see how it turns out. By using the word 'style' in the Title, and hyphenating it with 'deli', you are not quite accurate, as style should be applied to 'rye'. And here is my reason. Any person with a European background would never accept bread baked with less than 20% rye flour ( your 'one cup' ) as Rye Bread . 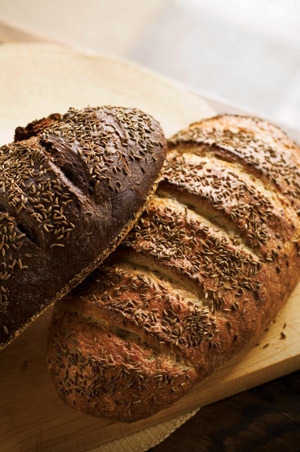 A half way decent Rye Bread has a minimum of 65% rye flour, and decent German bakers use up to 90% rye flour. I love this recipe for Reuben Sammies!